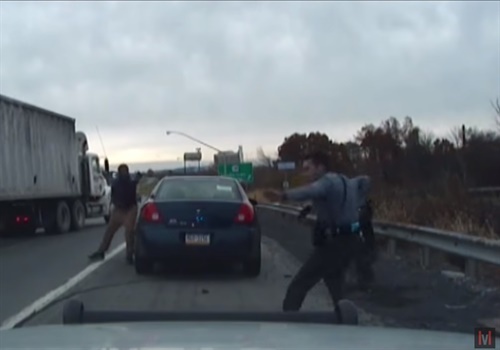 Northampton County (PA) prosecutors released dash camera video footage of a November 2017 incident in which Daniel Clary opened fire on Pennsylvania State Troopers during a traffic stop. According to the Daily Caller, the video of the shooting was played repeatedly at Clary's June 2018 trial, which lasted just four days and ended in his conviction on two counts of attempted murder. Trooper Ryan Seiple — who pulled Clary over for speeding in Plainfield Township — was critically wounded in the incident. Kelly suffered a severed femoral artery in the shooting and spent 25 days in the hospital after nearly bleeding to death.